Use a commercially available Sound Blaster MIDI cable adapter to connect the CTK-671 keyboard to a computer as illustrated below. *1 Also requires a Sound Blaster or equivalent audio card and joystick port. *2 Connect the cable's OUT connector to the keyboard's MIDI IN terminal, and the IN connector to the MIDI OUT terminal.  Before connecting your CTK-671 keyboard to your computer, make sure that the keyboard and computer, as well as all other peripherals connected to them are turned off.  The location of the joystick port depends on the type of computer you are using. Check the location of the port on your computer before performing the following steps. For details, see the documentation that comes with your computer and audio card.  Never disconnect the Sound Blaster MIDI cable adapter while the Music Data Management Software for CTK-671 is running. Doing so not only will cause the software to malfunction, it can also corrupt data and cause malfunction of your CTK-671 keyboard and/or computer. First, confirm that your computer is equipped with a Sound Blaster or compatible audio card with a joystick port (Dsub 15-pin) like the one shown in Figure 1. 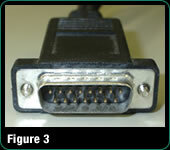 Connect a commercially available Sound Blaster MIDI cable adapter (Figure 2) to the joystick port shown in Figure 1. 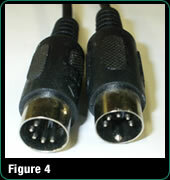 Plug the MIDI connectors of the cable (Figure 4) into the CTK-671 keyboard's MIDI terminals (Figure 5). Connect the cable's OUT connector to the keyboard's MIDI IN terminal, and the IN connector to the MIDI OUT terminal.  Before trying to use the connection, be sure to read the applicable documentation that comes with your computer and audio card, and your Windows documentation.  If your computer does not have a joystick port, you can connect your CTK-671 keyboard using a commercially available USB MIDI interface. Note, however, that some computers do not support use of a MIDI interface. Be sure to check whether your computer supports use of a MIDI interface before actually purchasing one.